1st Armored Division M3 Lees roll through downtown. Louisiana, Aug-Sep 1941. 1st Armored Division M3 Lees, supported by A-20 Havocs, blast their way past defending 37mm anti-tanks guns near Castor, Louisiana, 14 Sep 1941. 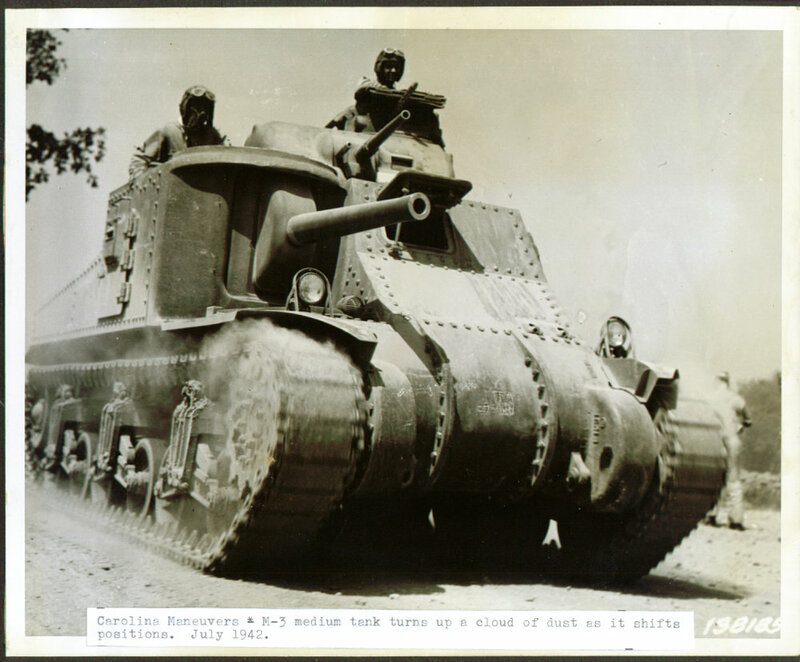 M3 Lee tank in Carolina Maneuvers 1941. Bridge failure in Monroe, NC. Tanks on flat-cars. Rock Hill, 1941. M3 Lees on train. Rock Hill, SC. 1st Armored Division tanks on Rock Hill Road. 1st Armored Division M3 Lee “B-10” and M2 during 1941 Carolina War Games. 11 Nov 1941. Fortified pontoon bridge over Pee Dee River, 1941. Tank on pontoon bridge Pee Dee River, SC. Pontoon bridge over the Pee Dee River. Fort Knox, Kentucky, Jun 1942. Note: OD interior of driver's viewer hatch. Library of Congress photo LC-USW36-161. M3 medium tank driver looking through the forward port hole. Fort Knox, KY, Jun 1942. Note: the white color on the interior of driver's hatch is from artificial light utilized for the photography session. Library of Congress photo. M3 medium tanks at Fort Knox, KY, Jun 1942. Library of Congress photo. M3 Lee at Fort Knox, Jun 1942. 1st Armored Division training. Northern Ireland, 28 Jun, 1942. M3 Lee U.S.A. # W-309490, D Company, 2/13 Armored Regiment, 1st Armored Division. Souk el Arba, Tunisia, 23 Nov 1942. Company F, 2nd Battalion, 13th Armored Regiment, 1st Armored Division. Medjez el Bab, Tunisia. Nov 1942. Crew of M3 U.S.A. # W-309490 showing off their main gun rounds. M3 crew practice abandoning their tank at Camp Polk, Louisiana. 12 Feb 1943. Co. B, 741st Tank Bn. 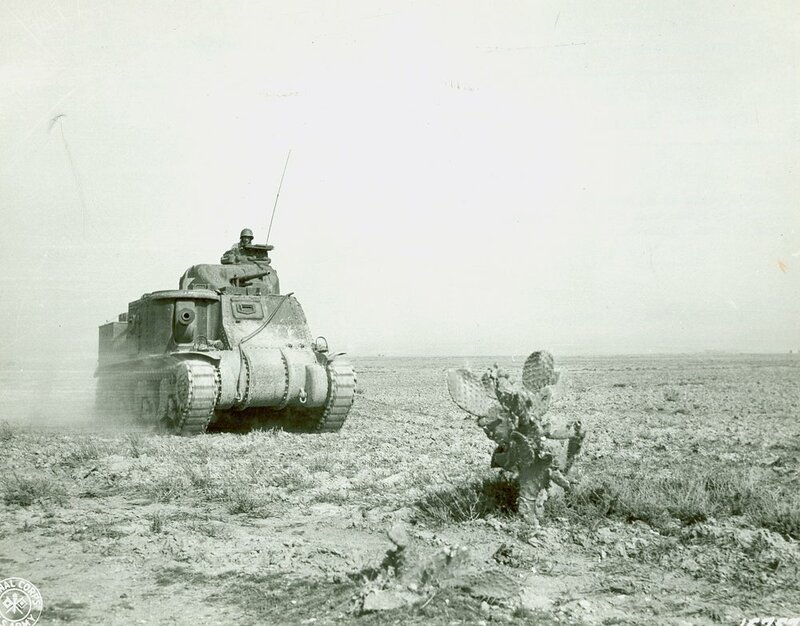 M3 Lee near Kasserine Pass, Tunisia, late Feb 1943. ''ARAB'' 13th Armored Regiment, 1st Armored Division. El Guettar, Tunisia. Apr 1943. Photo 1 of 2. ''ARAB'' 13th Armored Regiment, 1st Armored Division. El Guettar, Tunisia. Apr 1943. Photo 2 of 2.